Designed by Norman Foster and affectionately, and understandably, dubbed "The Gherkin" thanks to its unique bullet-shape tower, 30 St Mary Axe stands out as one of the City of London's most stunning and critically acclaimed architectural features. Looming up at 180 metres tall it towers over nearby constructions and with its tessellated glass exterior and unique energy-saving methods was voted (December 2005) the most admired new building in the world. It's hard to miss if you're wandering around the City and, thanks to the 2018 opening of restaurant and bar Helix and Iris, it can be enjoyed from inside as well as afar. Located on the 39th and 40th floors, the unique space is one of London's most unique eating and drinking destinations. What are the best dining options near The Gherkin or 30 St Mary Axe London? The Gherkin or 30 St Mary Axe gyms, sporting activities, health & beauty and fitness. The best pubs near London The Gherkin or 30 St Mary Axe. 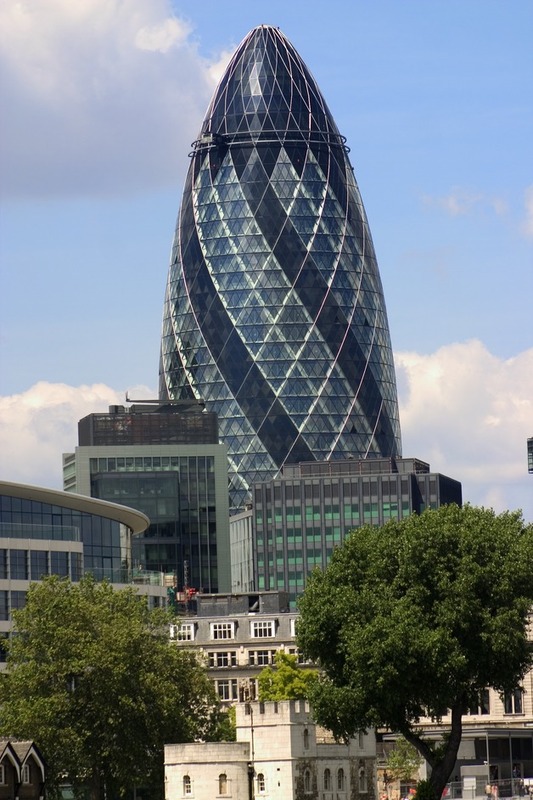 The Gherkin or 30 St Mary Axe clubs, bars, cabaret nights, casinos and interesting nightlife. Where to have your meeting, conference, exhibition, private dining or training course near The Gherkin or 30 St Mary Axe. From cheap budget hotels to luxury 5 star suites see our deals for The Gherkin or 30 St Mary Axe hotels, including 196 Bishopsgate Serviced Apartments from 85% off.